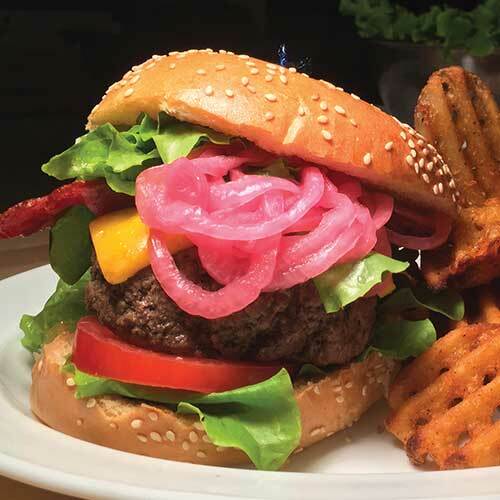 Gills Onions is peeling back the layers this year and bringing the tangy flavor profile of pickled red onions to foodservice menus with a new and improved recipe for the delight of chefs and consumers alike. Joining me to dish on the new item is Teri Trost, Midwest/West Regional Manager, who shares some of the highlights, advantages, and features of the new pickled red onion slivers. Get on board the flavor train with the benefit of no additional labor, she adds with a laugh. Gills pickled red onions are an all-natural, kosher line that is ready to go upon delivery. The bright color comes from the red onions themselves, as they ‘pickle’ in the packaging. Teri shares that the consistent flavor profile lasts until the last day of shelf-life, along with the crunch and color. Opening does not affect shelf-life or other flavor attributes. These pickled onions from Gills come in a 5 lb. bucket, much in the way that fresh-cut fruit is packaged. With the added benefits of its easy-to-use and store packaging that helps to prevent spilling, foodservice partners can bring a new versatile veg preparation into the kitchen. The product itself is a red onion sliver (1/4” x 2” prior to pickling) so easily incorporated into any type of menu offering. “Use them on a burger or sandwich to build flavors, and even on tacos or carnitas. BBQ sandwiches rock with the flavor-pop the pickled red onions provide, and they can also be used as salad toppers, on smoked salmon platters, and as a soup garnish on thicker soups like tomato basil bisque, split pea, or cream of anything soup,” Teri shares. Try them as a garnish for guacamole, add to ceviche or Indian food dishes as one of the condiments, include in hot dog toppings, or add to any charcuterie board to elevate the spread…Teri’s suggestions are endless—a topper for huevos rancheros, pizza, poke bowls, you name it. “Also, the brine can be used to pickle other vegetables in the kitchen, create pickled eggs, vinaigrettes, or marinade for meat. Think kebabs!” she adds. Whether chefs are looking to add intensity to their dishes or differentiate their flavor profiles, pickled red onions provide a flavor that transcends cultures and their cuisines. “Open your palate to the world of pickled red onions from Gills and watch your customers comment on what a great addition it was to their meal,” Teri smiles and wraps up. But you can tell, from her passion for the product and her love of delicious diverse meals and flavors, that there is no end to the options she can think of or the path these pickled red onions can lead a dish and an imagination.